Thanks to everyone who came to see Gamelan Taniwha Jaya play in Wellington recently! In 2015 we’ve also performed at the Newtown Festival, the Southeast Asian Night Market, and Indonesia Day. Gamelan Taniwha Jaya is a group of New Zealand musicians dedicated to the study and performance of Balinese music. They specialise in contemporary music for Gamelan Gong Kebyar, and frequently incorporate western instruments into the ensemble. The name combines a NZ Māori word (Taniwha – a mythical water monster) with a Balinese word (Jaya – glorious or victorious) to symbolise the mix of New Zealand and Balinese cultures. The group perform on a set of instruments made by Pak Rantes in Denpasar, Bali, which was bought by Gareth Farr in 2003. The gamelan is the traditional percussion orchestra of Indonesia, and Bali’s Gong Kebyar style is characterised by unpredictable rhythms and wild dynamic contrasts. Entirely comprised of bronze metallophones and gongs, it has a vibrant and complex sound, and the music shimmers and pulses with a broad range of sound from tiny high tinkling metallophones all the way down to massive booming gongs. Gamelan Taniwha Jaya was launched in August 2003, and since then has been involved in many projects and performances – including a collaboration with one of NZ’s most popular acts, Minuit, at WOMAD 2012. 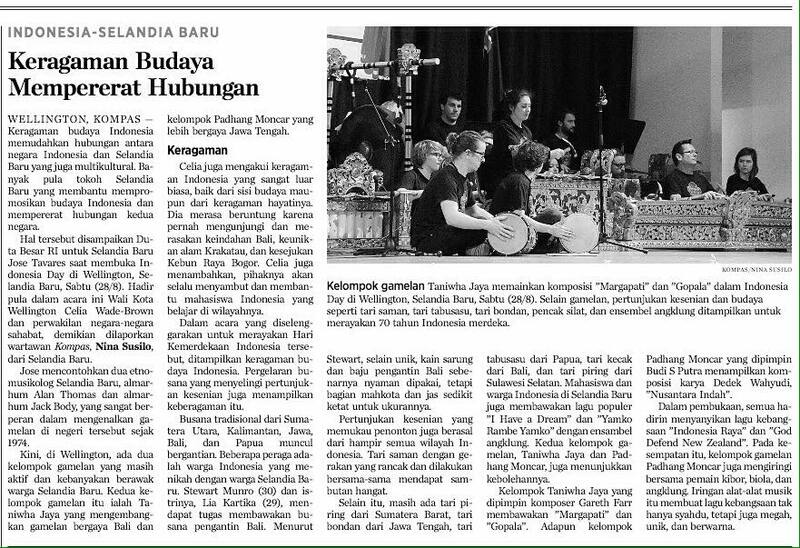 Recent Highlights include performing with throat singer Jonny Marks at the 2014 APRA Silver Scrolls, and a 2013 tour of Indonesia where they performed at the Yogyakarta Gamelan Festival in Java and the “North to South” International Concert of New Music for Gamelan in Ubud, Bali. This entry was posted in 2010, 2015, 2016, Asia, Indonesia, Music, New Zealand, video and tagged acoustic, Bali, ethnomusicology, gamelan, Gamelan Taniwha Jaya, Gareth Farr, Indonesia, Southeast Asia, video, Wellington.